The Hedon Blog and HU12 Online 'Beat-Blogger'. Bringing 'hyperlocal' news to local people; better informed, engaged and active local communities! SEND US YOUR BEST CLUB IMAGE PLEASE! UPDATE: The Networking Event will now be on Saturday 6 and Sunday 7 October, 10am – 5pm. Also an evening session on the Friday 5 October (the opening of HIP Fest) from 6pm – 8pm. Our presence at the event will focus around a stall that we need to staff. So if you can volunteer some time during the long weekend, your help would be appreciated and we can arrange shifts. On Saturday and Sunday 13th and 14th October we have been invited to take part in a networking event with other photography groups (both actual groups that meet regularly and online groups) as part of the Hull International Photography Festival (HIPFest 2018). An inter-club networking event is being organised that will include a slideshow being put together and we’ve been asked to submit up to 30 images. These images do not have to fit a theme, but it has been suggested that it would be nice to keep a general theme of photos taken in Hull and surrounding areas. Additionally, I would suggest our photos might reflect the club’s activities i.e. taken at our meetings, on trips. part of our A-D or weekly competitions, etc. So we need to gather together at least 20 but not more than 30 images that will be displayed on a 6×4 foot (landscape orientation) projection screen at points throughout the weekend. CAN WE START by people sending me BY EMAIL please their favourite/best photograph (needs to be high resolution) with your name as part of the filename please. For this weekend event we won’t need HIPfest passes, but I’d encourage people to buy them anyway (£5) to be able to take advantage of most of the HIPFest exhibitions and workshops (starts Friday October 5th). I’D NEED YOUR PHOTOS THIS WEEK PLEASE, or by Wed 26 September at the very latest. More at our meeting on Wed 19 September, 7pm at Haven Arms, Havenside, Hedon. We are meeting on Humber Dock Marina at Humber Street at 11.00am and we’ll be taking part in a walk that takes us across Hull’s Old Town and eventually leading up to Bankside/Wincolmlee. And aim to end the walk with refreshments at the Whalebone pub. WHETHER you call it street art, urban art, guerrilla art or graffiti art, there is no denying that such art forms have become acceptable with permission being granted in some places in Hull to create it. On Saturday 15 September 2018 Hedon Viewfinders is going to go on a Graffiti Hunt to see what all the fuss is about! With the ever-changing nature of this art form we can almost guarantee that there will be something different to see this week than last week. ALL WELCOME – you don’t have to be a ‘member’. It’s a free, fun and friendly walk with enthusiastic photographers. We’ll aim to go ahead in all but the worst weather. Viewfinders Meet-up – Team Challenge event! HEDON Viewfinders next meets on Wednesday, September 5 2018 at the Haven Arms, Havenside, in Hedon. The Meet-up will include a special Team Challenge event which will offer some fast and furious fun whilst challenging each of us, with our team’s support, to come up with a different approach to photographing something. HEDON Viewfinders next meets 7pm on Wednesday, September 5 2018 at the Haven Arms, Havenside, in Hedon. The Meet-up will include a special Team Challenge event which will offer some fast and furious fun whilst challenging each of us, with our team’s support, to come up with a different approach to photographing something. Those present will form into evenly-matched teams and each will be faced with the same set of challenges to photograph subjects or objects – you will be racing against the clock, and each team member needs to have taken their own distinctive photograph from each challenge; the outcome of each will be a team set of images. This is something different for Viewfinders and promises to be a fascinating exercise that depends on us all taking photographs; so bring your cameras and kit lenses. The aim will be to reveal each Team-set of photographs at our next meeting on the 19 September and decide on the winning team entry. The meeting will also update members on progress with our funding campaign and discuss our major new prize competition. All Welcome. Attendance is not restricted in anyway. Free, fun and friendly! Hedon Viewfinders will interest photographers of all levels regardless of ability, image making device (whether camera or phone), kit or equipment. Novices particularly encouraged. Hedon’s free, fun and friendly photography group. Author Ray DuffillPosted on August 30, 2018 August 31, 2018 Categories MeetingTags Haven Arms, Hedon Viewfinders, Meeting, Team Challenge, Viewfinders - Through the LensLeave a comment on Viewfinders Meet-up – Team Challenge event! The letter ‘A’ kickstarts our new fun weekly competition! HEDON VIEWFINDERS new weekly fun competition started last night and will run Wednesday to Wednesday. We are starting with the theme – the letter ‘A’. HEDON VIEWFINDERS new weekly competition started last night and will run Wednesday to Wednesday. We are starting with the theme – the letter ‘A’. The outcome for the winner will be their photo on the Facebook group page header for the week and also published on this website. You can post up to 7 photos a day in the Facebook group and members who are not on Facebook can email their entries each week to viewfinders-ttl@gmx.co.uk or if you are on Flickr join our group page at www.flickr.com/groups/viewfinders-ttl/ and post there with the relevant #hashtag. You need to submit your entry before the Tuesday of each competition week. Also for your personal challenge and photographic development, you might want to take part in our 52-week Photography Challenge. Author Ray DuffillPosted on August 23, 2018 Categories CompetitionTags Competition, Hedon Viewfinders, Viewfinders - Through the Lens, weeklyLeave a comment on The letter ‘A’ kickstarts our new fun weekly competition! WED 22 AUG is the date of the Hedon Viewfinders Network Meeting. Starting at 7pm, Haven Arms, it is an opportunity for photographers to come together to make links with each other, discuss cameras and settings, and talk about anything to do with photography and promoting photography. Also to find out a bit more about Hedon Viewfinders. Free, fun & friendly photography club. WED 22 AUG is the date of our Hedon Viewfinders Network Meeting. Starting at 7pm at the Haven Arms this is an opportunity for photographers to come together to make links with each other, discuss cameras and settings, and talk about anything to do with photography and promoting photography. Hundreds of the club’s photography magazines will be made available for people to browse and take away (bring them back at a future meeting) for a small donation. We’ll also have our large collection of photography books available to browse too. The books, like the magazines, have all been donated to the club over the last two years. Buying, selling & swapping. Such a Network event also provides an opportunity for people to bring along any surplus camera kit with a view to arranging your own private sales or swapping with others in attendance. It is also a chance to talk with other photographers about subjects and issues of common interest; an opportunity to get the support of others for an idea for an event, trip, or project perhaps? A group of club members met last Tuesday to discuss fundraising ideas, particularly those which also promote photography, so we will outline some of those ideas at the event (includes, amongst others, the idea of a major calendar competition, a photography fete, and a fundraising stall). We’ll outline our plans to purchase our own exhibition boards. Being part of the local community, the club has also been invited to get involved with several local charity initiatives which involve opportunities to practice different areas of photography. We will be seeking volunteers! In a relaxed, informal setting – we expect this Network Meeting to be a very productive event. THE NEXT MEETING of Hedon Viewfinders is on Wednesday 8 August 2018 at the Haven Arms at 7pm. THE NEXT MEETING of Hedon Viewfinders is on Wednesday 8 August 2018 at the Haven Arms at 7pm. The theme will be around ‘longer exposures’ i.e. looking at some of the challenges photographers face taking sunsets, seascapes, star trails, etc. We hope to have a practical session too (weather permitting). We’ll be previewing some of our 52 Week Photography Challenges which are coming up and relevant to the above theme. We’ll be talking about the Hull International Photography Festival to be held in October (5th – 28th) and the club’s opportunities to get involved. Fun, free, and friendly photography club open to all regardless of your level of skill or whatever camera/image-making device you have available. All Welcome. HEDON VIEWFINDERS is holding a Quiz & *Barbecue Night next Wednesday 25 July 2018 starting at 7pm which (weather permitting – and we’ve had some glorious sun lately) will be held outside at the Haven Arms. It’ll cost £10 and is meant to be a bit of fun and carrying on our ‘Quizzes’ tradition started at the Christmas Party last year. Also lots of opportunity to talk informally about upcoming plans for our fun and friendly photography club. We need to know if you are able to make it by this coming Sunday night (22 July) please. *And let us know if you require a vegetarian option for the barbecue. Wed 8 August – ? Wed 19 September – ? Wed 3 October – ? Wed 17 October – ? Wed 31 October – Dry ice & smoke night. And one or two other features…! Hedon Viewfinders is your club responding to your photographic interests – so we value your input – please do give us your ideas. We’re also seeking those who might like to get involved in club sub-groups dealing with making plans for fundraising, exhibitions and events/trips & outings. Note all our photography opportunities are open to all (not restricted by membership) – please invite those you know would be interested. Because of the England V Croatia football fixture we have POSTPONED our URBAN ART PHOTOWALK planned for Wed 11 July. But join us at the Haven Arms to watch the football. Kick off at 7pm! We’ve been unlucky with our Summer Programme with all our events having been affected by the ENGLAND football team doing pretty well. So we have POSTPONED our URBAN ART PHOTOWALK planned for Wed 11 July. Keep an eye on Club news channels for changes to our other events too. Our Club Room and the big screen at the Haven Arms is being used to screen the Football on the Wednesday night – so if club members want to meet up to watch the match with other fans – please do! A photography-free night (or will it!?) of football joy – fingers crossed. Croatia V England – kick off at 7pm. SHORT NOTICE… but still worth a visit to Hull City Centre TONIGHT (Thursday 5 July) with our cameras. Fancy a trip into Hull tonight for “BLUE THURSDAY”? Whilst some might politically challenge the colour chosen to mark the NHS’s 70th birthday, buildings, historic monuments and other high profile sites across the country will be ‘lighting up’ blue on the evening of Thursday, 5 July. NHS Hull Clinical Commissioning Group has joined forces with Hull City Council to bathe several of Hull’s recognisable monuments in blue light. This is a great opportunity for photography. People can join up with Hedon Viewfinders; meeting at Hull Pier (outside the Minerva pub) at 9:15pm to capture the sunset, and then have the stroll alongside the Marina to Queen Victoria Square for 9:45pm’ish. People are encouraged to share their photos via social media using the hashtags: #NHS70 and #LightUpBlue. Photos taken on Hedon Viewfinders visit to town in April. TUESDAY 3 JULY we are meeting at EAST PARK which, with 130 acres of parkland, is Hull’s biggest park! It’s a Grade II listed park with up-to-date facilities, but also some historic treasures, lakes and gardens. We aim to meet in time for a prompt start at 7PM at the Holderness Road main gates. Hedon Viewfinders is a Out & About photo club and we seek to provide opportunities for people to enjoy social photography in the company of other enthusiasts. For summer July 2018 we are organising a series of field trips (weather permitting) and invite you to join us in these photography opportunities. The park is advertised as open until dusk but we’re going to give ourselves until 8:30pm. Think of it as a taster session; if you’ve not visited the park for some time – we’re sure you’ll become a regular visitor with your camera. As always, opportunities to talk cameras, settings and all things ‘photography’ at our free, fun and friendly club outings. Sat 7 July – Hedon Festival (the town’s busiest day of the year) – From mid-morning to midnight. #Hedfest18 includes a carnival parade and opportunities for event, street and gig photography. Wed 11 July – Graffiti hunt (Urban Street Art). Bankside, Wincolmlee & Old Town Hull. 7pm start. Sat 14 July – Waters’ Edge, Barton. 1:30pm. Tues 17 July – Withernsea night. Wed 25 July – Quiz and Social Night at the Haven Arms. There will be a cost for this for food – (£ to be confirmed). Hedon Viewfinders will interest photographers of all levels regardless of ability, image making device (whether camera or phone), kit or equipment. Novices particularly encouraged. Wed 1 May, 7pm @ Haven Arms, Havenside, Hedon HU12 8HH. Subject: Practical Photography – Messing with Water. ALL WELCOME. Hedon’s free, fun & friendly photography club. 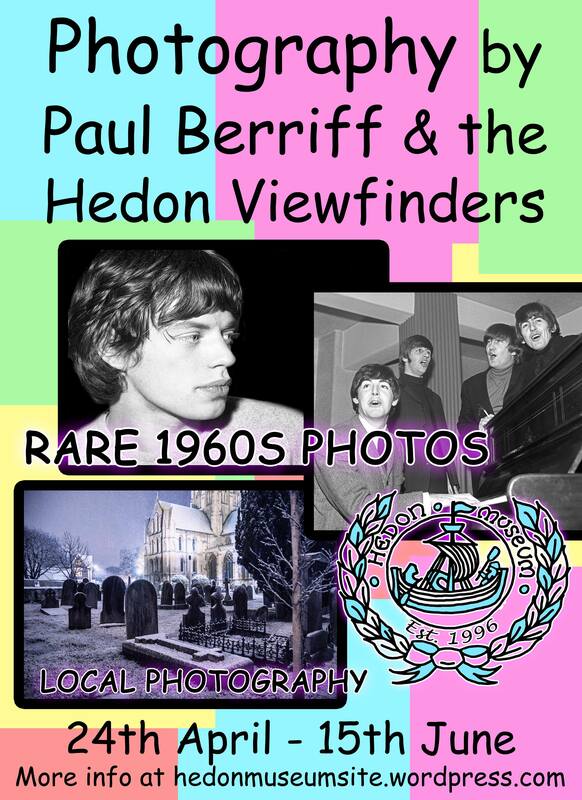 Paul Berriff and Hedon Viewfinders Photo Exhibitions. Hedon Museum Wed 24 April – Sat 15 June. Open every Wednesday and Saturday, 10am – 4pm. Hedon Viewfinders Photography Club Powered by WordPress.com.